People Places says the Central is for people who are seeking a more spirited and modern small-town urban lifestyle. NEW PORT RICHEY – People Places LLC is has announced that the first phase of development on the Central will begin in February. The groundbreaking ceremony is scheduled for 4:30 p.m. Monday (Jan. 28) at Circle Boulevard and Central Avenue. A private reception is scheduled after the groundbreaking. Nestled next to Orange Lake and one block north of Main Street in the historic downtown district of New Port Richey, this series of apartments will provide more than 80 luxury residences for those seeking a more urban lifestyle. Rather than building an “apartment complex” People Places is creating a series of three story “mansion” type buildings that are part of the neighborhood. Each building will contain four to six individual apartments accessed by a single gated entry and stair hall. The spaces between the buildings are designed as a series of outdoor “rooms” containing amenities for residents and beauty for the whole town to enjoy. 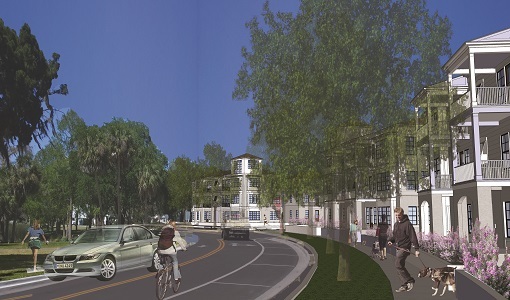 Central Avenue, which bisects the site, will get wider sidewalks, street trees and a tree-lined median, all framed with stately new buildings. Architect Eric Brown is designing the buildings with a nod to classic Southern architecture, spacious floor plans, high-ceilings, and high quality interior finishes. The apartments will be built in two phases, with the first phase located along Central Avenue. Phase 1 will include 42 one- and two-bedroom apartments in seven buildings. Residents will enjoy a pavilion and outdoor grill in a beautiful Live Oak-canopied courtyard overlooking Orange Lake. The location is a short walk from downtown nightlife, restaurants and shopping. Leisure activities and events at Sims Park, kayaking and boating, an award winning public library and a $15 million recreation and aquatic center are also within a short walking distance. People Places is crafting the Central for people who are seeking a more spirited and modern small-town urban lifestyle. People Places is a New Port Richey real estate development company that was founded by Frank Starkey with the goal of creating vibrant, people-oriented residential and retail places in walkable settings. Photos courtesy of People Places LLC.